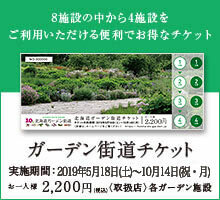 A garden that enjoys flowers together with majestic nature at the plateau called the Daisetsuyama system NO.1. We are making a garden by considering the garden created by the characteristic plants that match the climate of the northern country as "Hokkaido garden". Sakura Kuramoto A lot of people visited the garden which was the stage of the "Wind Garden" of the script, and is calling up a topic. You can enjoy a variety of gardens with nature of overwhelming scale at the foot of the Hidaka mountain range. It is famous as Japan's first Conifer Garden. The valuable collection that remains since the exploitation is spectacular. 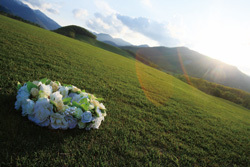 Flowers that change their expression every season, gardens with vegetables and fruit trees as theme will welcome you. Mr. Akiyoshi Shiotake, a garden artist holding ambition to "make Hokkaido as a flower island" is handling it. Growing flowers in the field drawn by painter Naoki Sakamoto in the forest, you can enjoy the work in the memorial hall. Many gardens on the Garden Road are doing wedding. Green lawn, rich forest, multicolored flowers and so on. For details please contact each garden.